Hurghada, on Egypt's Red Sea Riviera, is a magnet for beach lovers and water sports enthusiasts. It has changed out of all recognition from its small fishing village roots. Sandwiched between the desert and the sea, this lively resort is very popular with UK visitors. With kilometre after kilometre of soft sand and clear warm water with a fertile coral reef, this comes as no surprise. Added to these assets are its superb accommodation, good restaurants and lively nightlife. 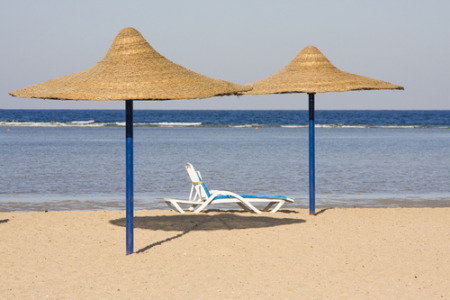 It is easy to see why cheap Hurghada holidays are in great demand. As a year round haven for sun worshippers and water babies, this modern resort has wonderful hotels providing high standards of comfort and indeed luxury. Service is excellent and every effort is made to make your stay pleasurable and trouble-free. There is no doubt that tourist’s come first and for most for Hurghada’s beach life, but recreational activities don't stop there. Things to see and do in Hurghada. With the desert on your doorstep you can enjoy a camel or a jeep safari into its wastes. You can also visit cultural sites or take a trip to Cairo. Always check the political situation before embarking on a trip to high population density centres. There are diving schools for those who are new to the sport, and those who are wary of diving and snorkelling can view the wonders of the coral reef from the comfort of a glass bottomed boat. Cheap Hurghada holidays can be as laid back as you wish. Spend your days relaxing on the beach under a palm-fringed sun shade or by the hotel pool, or enjoy the many water sports offered by the resort. Those who need a little retail therapy to complete their holiday experience will find shops, markets and bazaars where they can practise their bartering skills. If a Hurghada holiday appeals and you wish to avoid the tedium of trawling through web page after web page trying to find the best deal, use our search facility which has almost three dozen travel companies competing for your custom. Remember, competition brings the best bargains. Our search facility enables you to see, at a glance, the Hurhada holiday that is the cheapest. All you have to do to secure the holiday is make a phone call. To book the best deal, don't delay, ring today.